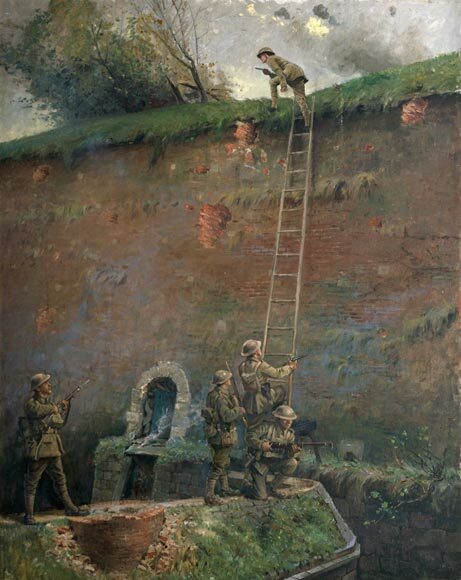 George Butler's painting portrays the traditional technique – using a ladder – the New Zealanders employed to capture the walled town of Le Quesnoy, in northern France, on 4 November 1918 in the last offensive of the First World War. They had decided to scale the ramparts rather than destroy them with artillery. 4 November 1918 is often regarded as the most successful day for New Zealand on the Western Front. The division advanced 10 kilometres, took Le Quesnoy and captured over 2,000 German prisoners.